Hands down, breakfast is my favourite meal of the day. Every morning, I have to eat something to wake up and be ready for the day ahead. On a work day it’s usually a quick one – a green smoothie or chia pudding, but today I’d like to talk about weekend breakfasts. The best kind. When pot after pot of tea is made, when the refrigerator door swings back and forth many times, and when we allow ourselves to linger around the table before getting on with the day. We like these breakfasts to be abundant, indulgent, and entirely weekend-like. Ever since Lisa wrote about these maca pancakes (Corinne’s recipe), I couldn’t stop picturing them on our table on a Saturday morning. 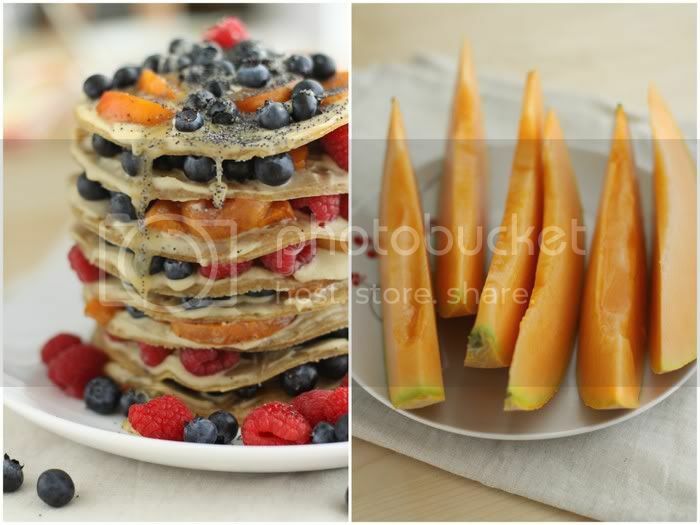 Lisa’s site is always full of the freshest culinary ideas, and she is very generous about sharing them. Thank you. My approach to pancakes has been a bit different, as I grew up eating the crepe-like variety. But these thicker, American style pancakes intrigued me. Almost anything that contains maca powder usually calls my name, and these guys just looked so good. I’ve been on an Irish moss kick for a while now, and of course my magical ingredient ended up in the recipe, adding a fluffy quality to the texture. The yogurt cream was a try and see sort of thing. Luckily, it was a hit, and I’ve been using it in many other recipes since. And so, one weekend morning, we assembled a tower of pancakes. Each layer was populated with a generous spread of yogurt sauce, berries, and honey-glazed apricots. Then a sprinkle of poppy seeds and one more drizzle of honey. It was a pretty mess, a leaning tower. Perfect for a lazy morning. Tower of pancakes or not, we hope you have one of these mornings soon. Enjoy. In a high speed blender mix together all but the last three ingredients until very smooth. Transfer the mixture to a bowl. Add the ground almonds, poppy and flax seeds, mix thoroughly. 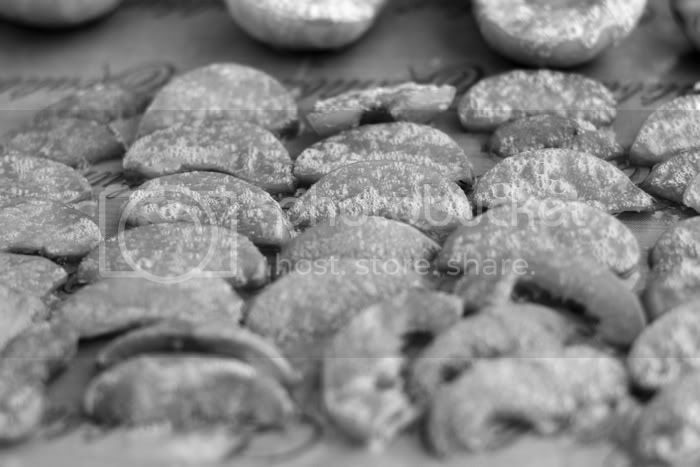 Spread to a desired thickness onto Teflex covered dehydrator trays. Dehydrate at 105F for about 6 hours, then flip over and dehydrate for another couple of hours until the pancakes are dry enough and ready to be cut into circles. We cut out the circles by using a bowl as a template. In a high speed blender, combine all of the ingredients until smooth and creamy. Slice apricots, drizzle with raw honey mixed with small amount of coconut oil. Dehydrate at 115F for 1-2 hours. 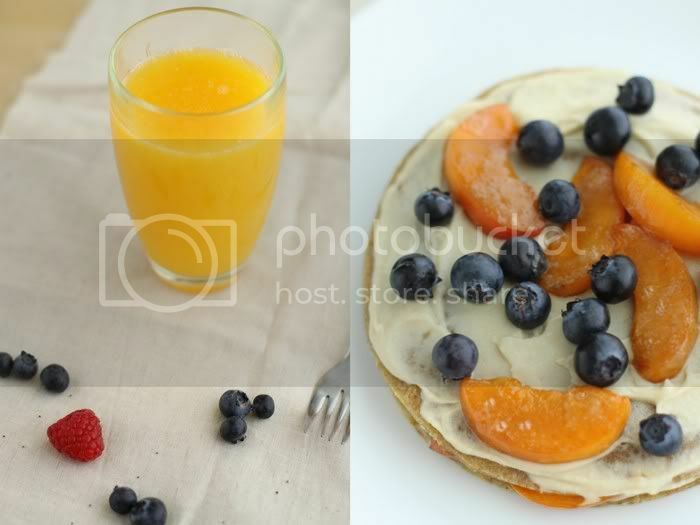 Spread the yogurt cream on each pancake, top with fruits of your choice, sprinkle with poppy seeds (optional) and enjoy. You can keep all the components separately, or in the form of a cake, like we did. Either way, it tastes great and holds well. How beautiful! Those honey glazed apricots look so delicious. I’ll have to try these soon! Hands down, the best looking pancakes I’ve ever seen. No doubt the healthiest as well. 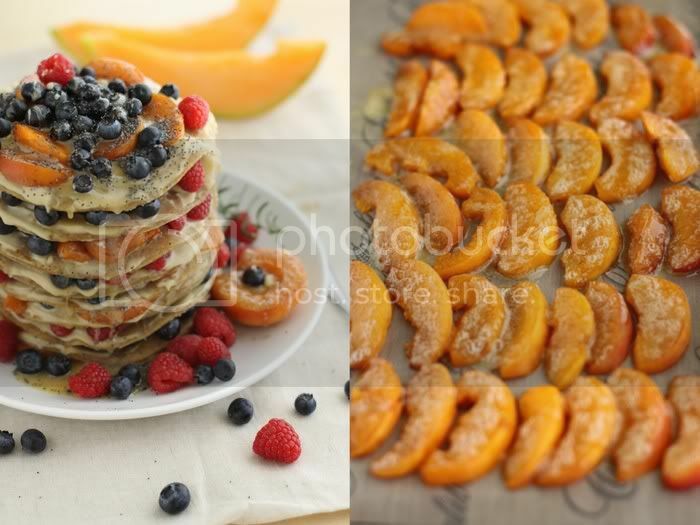 The photos are amazing and the description and ingredients are both mouth watering. Happy 4th! breakfast is my absolute favorite! I don’t understand people who skip it. these look so delicious, thanks for sharing. Your version looks like heaven on a plate. I’m so happy that a post on my blog inspired such delicious breakfast fare. Your artistry and creativity never ceases to amaze. Mmm sounds delicious and nutritious! Where do you get your Irish moss? I’ve been wanting to try it for awhile now. Happy (early) 4th of July!!!! Yummy, love this!!! Thank you, friends. Hope you have a nice holiday weekend. Lisa, thanks so much for the inspiration! Kelly, thank you. I get Irish moss here. Wondering what would be a substite for Bio K acidophilus? Although I prefer crepes to pancakes hands down, I have to admit my admiration for this creative and mouth-watering pancake tower recipe. A keeper. Thanks. I love a big tower or pancakes and these look especially inviting! Oh, wow! I´m amazed! 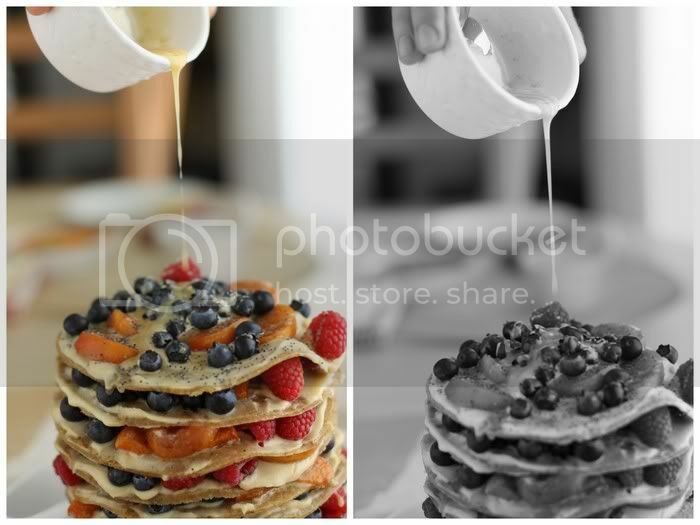 it´s funny because I just asked my over at my blog what everyones strongest “memory food” is.. Well mine is the pile of pancakes that my dad made! ever since I wrote that post I have been planning to make a Raw version of course.. THANK YOU so much for the inspiration! Loving it! (oh and instead of a pancake “memory food” tower I made a delicious dessert that tastes just like grandmothers strawberry jam! Mabye something I´ll but on my pancakes. Happy holidays! These pancakes are spectacular and even more so once I read all the amazing and delicious ingredients you have here, yum! Thank you especially for the yoghurt recipe, so good!! Thanks again for the comments, guys! Susan, you can use any acidophilus, which you can find refrigerated in a health food store. If you don’t want to use acidophilus, you can eliminate it entirely and the sauce will still be good, though less yogurt-like. These look outstanding and finally tipped me into the land of ordering Irish Moss. :) Thank you for the inspiration! I have a practical question, though. Given that these dehydrate for 6 hours, get flipped, and dehydrate for a few more hours, do you set an alarm, flip them, and go back to bed in order to have them for breakfast? Laura, thank you for your comment. I usually make these things ahead of time. I never get up at night or early in the morning just to flip things :) Sometimes, I’ll get up a few hours before everyone else is up and ready for breakfast, flip, and by the time the family is hungry, things are ready. Hope this helps! So glad you’re liking this recipe!